When Pontiac designed its V-8 packages, each engine type was subjected to an endurance test, which consisted of static operation at 4,500 rpm on a dynamometer for 100 consecutive hours without shutdown. The engine was then completely disassembled and inspected for any signs of abnormal wear. If nothing of significance was detected, it was one step closer to reaching production. Through durability testing, Pontiac’s goal was to develop an engine that could endure 100,000 miles of normal use before requiring a rebuild. Extra material was cast into the components so that each could easily accommodate being moderately machined at least once. Modern passenger car engines are designed to last 150,000 miles or more, and there are a number of factors that allow it to accomplish this. Modern machining and finishing techniques, piston ring technology, and engine oil quality are generally considered better than ever before. Modern fuel injection ensuresinstant startup and improved coldweather operation, and prevents excessive fueling to wash the oil film from the cylinder walls. An engine dynamometer is an excellent tool for breaking in an engine and measuring output under full-throttle load. The best machine shops or engine builders use a dyno to ensure a completely assembled engine operates properly before delivering it to a customer. Measured output values can tell you if your engine meets your performance expectations. Any engine may require a rebuild for any number of reasons, even one that had a rebuild recently performed. Abnormal thrust bearing wear is evident in this particular Pontiac engine, which might indicate improper bearing main cap alignment or insufficient thrust clearance. In either instance, it requires a rebuild. In addition to those advancements, most modern cars are typically lighter and can accelerate with less resistance to motion, lessening the overall load an engine sees on a daily basis. The use of overdrive transmissions equates into reduced engine RPM during normal conditions. Even without these advantages, but with routine maintenance and general care, it’s common to find a Pontiac V-8 that exceeded the 100,000-mile mark by many thousands of miles. Neglect often results in an engine that falls well short of its intended lifetime. There’s no telling what type of lifestyle your Pontiac led prior to your taking possession of it. If your Pontiac V-8 operates smoothly, doesn’t use oil, and doesn’t smoke, chances are that it’s in relatively good operating condition. But it may not be in perfect health and may benefit from a complete rebuild. When looking for an engine to rebuild, you can tell that an engine has been rebuilt if it has been freshly painted and is relatively free of heavy grease deposits. I prefer an engine that is completely covered in grime because it generally indicates it is a complete original that hasn’t been tampered with over the years. This particular 1966 389 4-barrel could be an excellent foundation for a restoration application. Even the newest Pontiac V-8 is at least 30 years old, so it’s quite possible that your engine has already been rebuilt at some point in its life, but there’s also a chance that it’s never been apart before. There’s no way of knowing an engine’s internal condition without complete disassembly, and unless you’ve owned it for a number of years, you really have no way of verifying originality. No matter your engine’s circumstances, now might be the opportune time to give your Pontiac a complete refresh. The purpose of any engine rebuild is to eliminate the internal wear that results from normal operation and restore any lost performance. A typical rebuild should include machining each contact surface, replacing all sacrificial components, and installing new bearings, seals, and gaskets. If properly executed, the effort should provide you with a Pontiac that runs at least as well as the day it rolled off the assembly line, and the use of high-quality gaskets and seals should prevent any annoying oil or coolant leaks. There are other factors beyond normal wear that might force an owner to rebuild an engine. Those might include incorrect assembly by a shop during a prior rebuild, significant damage from component failure after exceeding the engine’s intended operating range, or simply bad luck. The machining performed during the rebuilds, or the extent of damage that occurred when a component let go, determines how useable your existing components are. One of the first steps to any successful rebuild is creating a sound plan of action. You need to determine which category your rebuild best falls within. Is your engine a strictly stock rebuild, a mildly modified street engine, a significantly modified street/strip, or something in between the previous descriptions? After you’ve identified the type of engine you want, and the application for the engine, you need to establish a fairly certain horsepower and torque target. This helps you and a machinist to select the parts to meet your goal, and then establish the budget for build project. Each type of rebuild requires a different rebuild plan and different machine shop services. 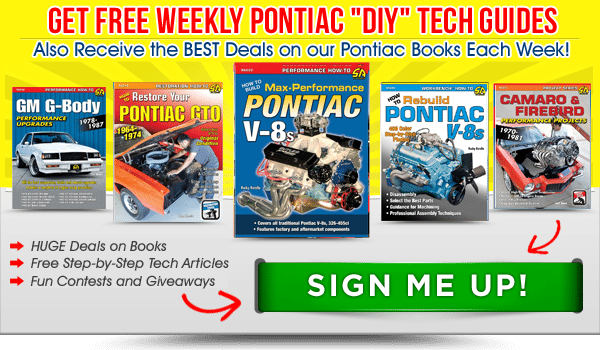 Is your vintage Pontiac driven often and you simply feel it’s time to rebuild its engine back to near-stock specs? Are you performing a frame-off restoration and looking to rebuild and restore your Pontiac’s numbersmatching engine? Or are you less concerned with originality and simply looking to increase your Pontiac’s performance while maintaining a relatively stock appearance? You need to identify the vintage or your Pontiac V-8 and determine of the existing components are capable of meeting your performance expectations in stock or mildly modified form. If your machinist is unfamiliar with the various Pontiac castings and the capacity of each, then it may be best to use one of the many proven combinations found in Chapter 9, or contact one of the many Pontiac builders listed in the Source Guide. The answers you receive should include recommendations for total engine displacement, which pistons, connecting rods, rings and bearings should be used, and the camshaft specifications and cylinder heads that help you reach your performance goal during your rebuild. There are two other important questions that you must ask yourself when planning your engine rebuild. How much money do I have to spend on the entire project? And how much of the actual engine assembly work am I willing to perform myself? Only you can answer all these questions, and it is common to be undecided at this point of the rebuild. You do, however, have to take a realistic approach and need to stick close to your plan once you commit to it. When considering all that’s involved in a complete engine rebuild, some hobbyists are more content taking a complete engine to an engine builder and returning when it’s ready for reinstallation; others enjoy performing some or all of the assembly process themselves. You must be realistic when assessing your experience and skill level when tackling your engine rebuild because small errors can result in significant consequences and ultimately lead to engine failure. But attention to detail and proper guidance can keep you from making costly mistakes, and that’s the purpose of this book. I know of very few hobbyists that wouldn’t want their Pontiacs to run better. However, most hobbyists don’t gauge “better” by using a drag strip or engine dyno. To most, “better” means the amount of tire spin that occurs upon a brisk take off. Depending upon the application and what you’re beginning with, simply performing a basic rebuild to a tired engine may be enough to accomplish that, but some applications might not contain the ideal components to achieve that. Though generally not regarded as a tool, compressed air is great to have available for myriad reasons. 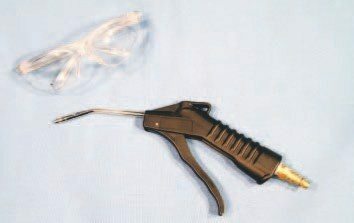 An air-blow gun can be used to remove decades of dust and grime, especially after being loosened with solvent and a wire brush. Though the use of eye protection is suggested throughout the entire rebuild process, it is mandatory when using compressed air. Air-operated tools seem to make any job easier. While I often use such equipment for more common repairs, I prefer hand tools when rebuilding an engine. It allows me to feel just how much effort is required to remove or install a fastener, and that can be a telltale sign of thread or fastener damage. 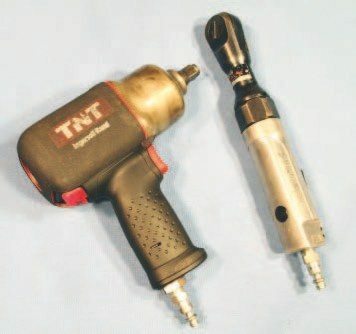 A pneumatic impact wrench can be used to remove high-torque harmonic balancer and main cap bolts. Pontiac designed the components of a given combination to complement one another and perform suitably for its intended application. 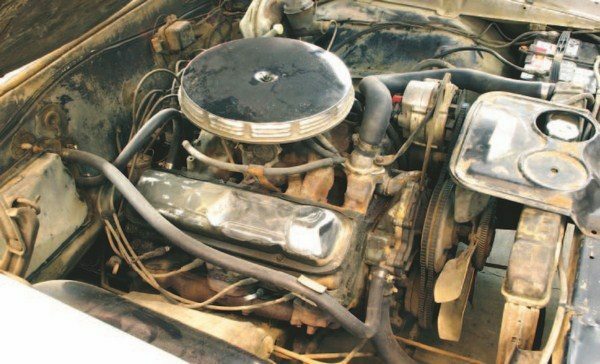 A particular low-performance engine may have used a 2-barrel carburetor, small-valve heads, and a mild camshaft, but for the most part, its remaining components were the same as those on a similar 4-barrel offering. By simply swapping parts around, generally speaking, it’s quite possible and cost effective to increase the power output of a 2-barrel to match that of a similar 4-barrel offering. Significantly increasing an engine’s power output almost always requires using high-performance factory pieces, such as those from Ram Air engines, or significantly modifying 4-barrel pieces to extract maximum potential from them. Either of these approaches can be quite costly. Though still expensive, it’s often easier and more cost effective to purchase some aftermarket components designed as replacements for the desirable stock pieces. Additional information on parts selection and power levels are covered in later chapters. If you’ve been wrenching on cars for any amount of time, you likely understand that using the most expensive tools doesn’t make a mechanic great. The absolute best tool for any job is the one that helps you complete a given task at a given time, and it doesn’t matter if it was purchased off a name-brand tool truck or from a reputable retailer. SnapOn, Mac, and other brands make professional hand tools for working mechanics. These fine instruments are a pleasure to use and should last a lifetime or longer. However, the at-home mechanic can competently rebuild an engine with Craftsman, Husky, and other high-quality consumer tools. But I don’t advocate using low-quality tools that can damage fasteners, round-off bolt heads, and generally make a mess of a basic job. A Pontiac Service Manual is an excellent resource that can provide information about specific details for a particular model year. Costly reprints are commonly available from various sources, but worn, lower-priced originals are often available on popular Internet classifieds or auction sites. 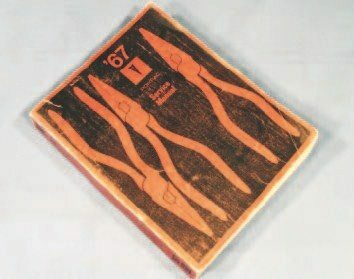 A service manual for the model year of the engine being rebuilt is must have for every enthusiast. 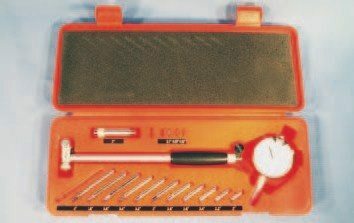 Various telescoping gauges, calipers, and micrometers are essential tools when performing any engine rebuild. They can be used to verify the measurements of most components. Units like these can be purchased at a reasonable cost from a local discount tool retailer. They’re accurate for engine-build measurements. A gasket scraper of some sort is an inexpensive tool that’s used to remove the gasket paper or sealant that’s generally left behind on mating surfaces during disassembly. 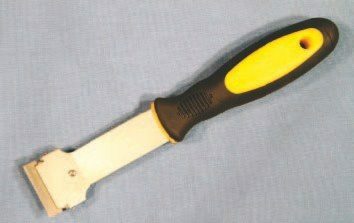 This unit uses a conventional razor blade that can be changed as often as necessary. One of the most important resources to have on hand during your entire rebuild is a Pontiac Service Manual that’s specific to the year of your engine. 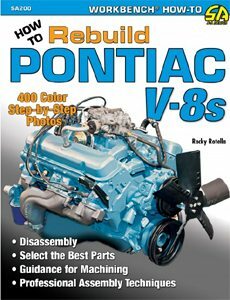 You’re probably wondering why I’d make such a recommendation if you’re reading a book entitled How to Rebuild Pontiac V-8s. Well, there’s a simple answer for that. Though the Pontiac engine family is so closely related, most individual engine models contain at least a few characteristics that are unique to certain model years, and a Pontiac Service Manual should address an area if it varies from what’s shown in this book. 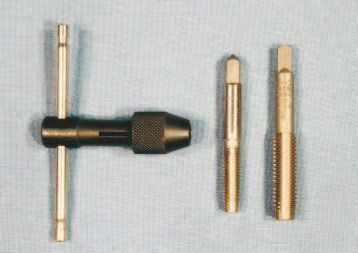 A complete tap and die set can be a valuable asset when cutting new threads into metal or restoring the shape of an existing one, but they’re generally rather pricy. Only a handful of basic taps of various sizes and thread pitches are needed during an engine rebuild, to chase the threads found on any cylinder head or block. A magnetic pick-up tool is handy if you’ve dropped something like a nut or washer into a crevice or the tight confines of the crankcase. A telescoping tool like this or one with a flexible head is an inexpensive purchase at your nearest parts store. 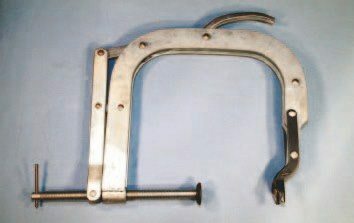 A valvespring compressor is required to completely disassemble and reassemble cylinder heads. Though units of various arrangements are available, I prefer a C-clamp style like this. It’s better to spend a few more bucks for a high-quality unit like this one from Snap-On, which won’t flex under pressure. 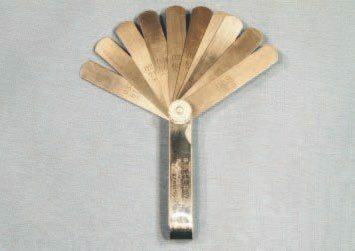 A feeler gauge is used to measure the clearance between two perpendicular mating surfaces. When combined with any precision straight edge, it can be used to measure cylinder head or deck surface warping. Units like this are available at any parts store and generally cost less than $20. 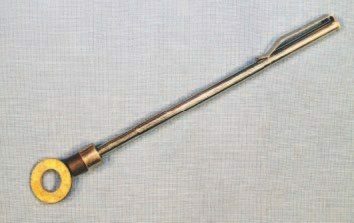 A dial-bore gauge can be used to measure areas of the block, such as the bore diameter, cylinder wall taper, and diameter of the camshaft tunnel and main caps. This unit was purchased from Summit Racing Equipment, cost less than $100, and has been very useful. 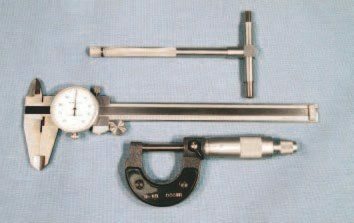 This valvespring micrometer, and other similar units, determine the installation height of a valvespring when combined with the particular length of valve and retainer that’s being used. Available within specific ranges, this Comp Cams unit measures from 1.4 to 1.8 inches. A digital camera is another excellent resource that can be used throughout the entire project. It’s beneficial when documenting the position of specific components during assembly. But it also allows you to provide your machinist with detailed pictures of any suspect areas you might have found in the disassembly process. With the relatively low cost of high-resolution point-and-shoot digital cameras and high-volume memory cards, it’s a wise investment for the project, and one that can be used for personal use too. Once you’ve laid out the rebuild path you plan to follow and have the proper equipment on hand, the next step is to locate a reputable machine shop in your area that can satisfy all of your needs. The best choice is one that comes recommended by fellow Pontiac hobbyists who have had direct experience with a shop. You may find some shops with several caveats and others with several attributes. In my opinion, a reputable, professional shop should be clean and able to perform such tasks as sonic testing, magnetic-particle inspection of components for cracks, fully machine a block and crankshaft, rebuild cylinder heads, prepare connecting rods, and completely balance a rotating assembly. It should also be able to procure replacement components, such as pumps, gaskets, and seals. Specialized procedures, such as nitride or cryogenic treatments, are often beyond the resources of typical engine building shops. If a machine shop must send any component to an outside company for specific machining processes, then the machinist should assume full responsibility for any failure that occurs and is found to be related to the component that was outsourced. Just the same, you can’t expect a machinist to stand behind any complete component you bring to the rebuild from an outside vendor. A machine shop technician must be able to work with a complete selection of compatible and complementary components because all the components must work in harmony to complete a strong, reliable engine. In addition, the machinist must be able to fully inspect each component and verify its parts, function, dimensions, and overall quality. If the machinist is not able to do this, the slightest problem or mistake can lead to a catastrophic failure. An example of this might be valvetrain failure related to cylinder heads that were improperly prepared by an outside vendor. Most machine shops can assemble certain components you’re unable to handle yourself for whatever reason. For instance, cylinder head assembly includes measuring valvespring pressure and installing valvesprings at the proper height. Allowing your machinist to assemble them is often a wise move. 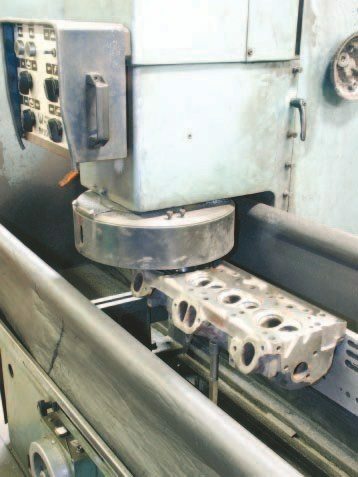 Or if you’re concerned with the critical measurements and minute clearances associated with the rotating assembly, or if correct rod and piston orientation is intimidating, your machinist may be able to assemble the short block for you at a reasonable cost, or suggest a certain engine assembler for you. 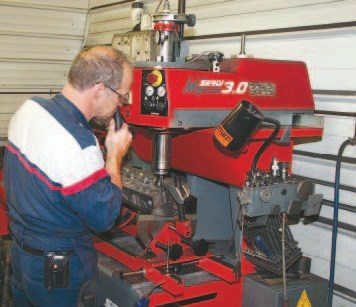 No matter how much or how little of the engine rebuild you intend to perform yourself, you need to find a machine shop that can meet your machining requirements. You want to find a shop that has rebuilt and/or machined many Pontiac V-8 engines because you don’t want a shop to make mistakes. If they have to learn the specs and machining processes while working on your engine, the chances of making mistakes are much greater. If you don’t have one already in mind, finding the best choice for you can be as easy as asking around to gather opinions. This may be as simple as attending local car shows and asking fellow Pontiac owners who they’d recommend for an engine rebuild. With so many affordable aftermarket crankshafts for other makes available today, there aren’t many modern machine shops that grind crankshafts in-house anymore. If your rebuild requires this, and if the machine shop you select subcontracts the task, ask for the name of the company. A high-quality machine shop should possess the equipment required to properly machine a Pontiac block. That includes using a Pontiacspecific torque plate for boring and honing cylinder walls and a line hone to restore main journal geometry. Balancing the reciprocating assembly involves attaching stationary weights to crankshaft journals, which replicates the effects of the piston-and-rod assemblies. The crankshaft is spun at low RPM and a strobe light is used to determine where counterweight mass should be added or removed to ensure smooth operation. Why did you select this machine shop? What was considered a complete engine rebuild? Was any portion of it sent out to another shop? How long did it take to complete your project? How long were you told it would take? How much work did you perform yourself? Were you completely satisfied with the results? Did the cost seem reasonable for what you received? Have you had any issues with your engine since the rebuild? 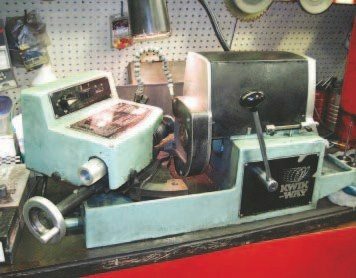 Would you use this machine shop again? If you’re satisfied with the answers to these questions, simply consider that machine shop as a possibility and move on to the next Pontiac owner for another opinion. Remember, when dealing with the minute tolerances associated with an engine rebuild, one can go wrong from time to time. A quality machine shop stands behind their work, however. Once you’re completely confident in one shop’s ability, you’re ready to contact them to inquire about the services offered. The term “machine shop” is often interpreted as a business that can rebuild an engine for a customer, but there’s a major difference between the services offered by an actual machine shop and engine assembling and building shops. 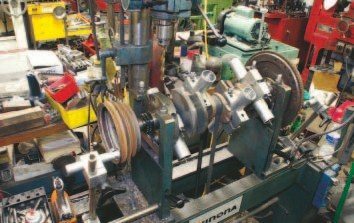 While modern machine shops often offer both machining and assembling services, some machine shops have no interest in assembling an engine after the machining portion a rebuild is complete. In these instances, it is your responsibility to completely assemble your engine or enlist the services of an engine assembler. An engine assembling shop in simplest terms is just that: a shop or person that assembles engines for customers. Some or all of the component machining is outsourced and the entire combination is assembled with little regard toward maximizing performance. The engine is typically fully assembled and ready for installation into a vehicle, but it may or may not have been fired prior to customer delivery, and usually does not include any form of tuning. An engine builder is best described as: a person or shop that designs and assembles a customer’s combination. It includes performing or arranging machining by one or more competent machine shops, and selecting the proper combination of components to help a customer achieve their performance expectations. 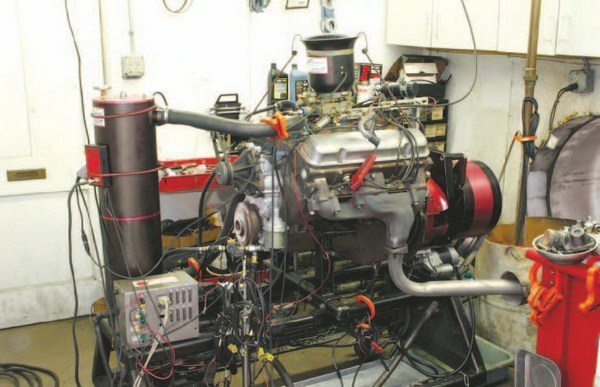 Engines are typically delivered to the customer completely assembled and fully tuned, and output should be documented with the results of dyno testing. There are distinct markets for all three services, and that’s something to consider if you’re going to have a shop assemble any part of your engine for you. No matter which route you ultimately choose, you should have a clear understanding of how your components are being machined and what machine shop is handling the task. It may be worthwhile to visit that machine shop before making a decision on moving forward. Any quality machine shop should have modern valveguide and seat equipment to precisely prepare its customer’s cylinder heads. This equipment from Serdi can cut multiple angles into a valve seat in a single pass, using the valveguide to properly locate the cutter in relation to the seat. If new valves are part of your rebuild, then there’s a chance that your machine shop does not need to use this piece of equipment. 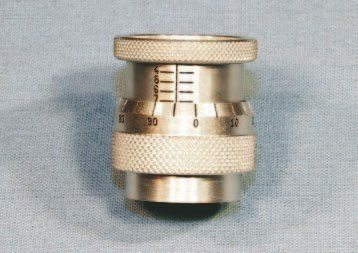 If you’re planning to reuse your existing valves, however, a valve grinder like this is required to restore the surface of the seat angle, or add other cuts that could possibly improve airflow. A surface mill is required when removing material from the mating surfaces of a block or cylinder head. Other uses include resurfacing a manual-transmission flywheel, or intake or exhaust manifold flanges. It’s a valuable piece of equipment that any machine shop should have. The high numbers of low-cost aftermarket crankshafts currently on the market has limited the number of cranks that a machine shop must prepare on a regular basis, and the high cost of such equipment can prevent newer shops from purchasing a crankshaft grinder. 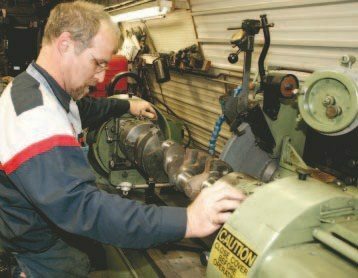 Unless your plans include an aftermarket Pontiac crankshaft, however, the machine shop you choose should have that ability to perform that task or confidence in the company it outsources it to. I also feel that the best shops are those that offer engine break-in with a test stand or engine dyno. This allows you to verify that your engine starts immediately, idles and revs smoothly, is free from oil and coolant leaks, and ultimately confirms that your engine has been broken-in properly before ever leaving the machine shop. If you chose to spend the extra money, a dyno tune can be a great tool to measure your Pontiac’s output and ensure that it’s performing reliably and optimally under full-throttle conditions. 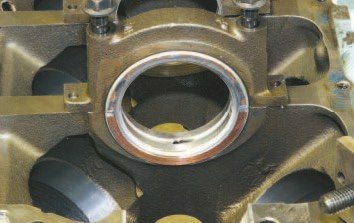 Before contracting a shop for your rebuild, clearly discuss your expectations and specifically disclose the wear parts (valvesprings, bearings, gaskets, etc.) you’ll be expected to buy from them. Most businesses have some type of policy in place that allows it to add a certain percentage onto cost of the project if a customer supplies parts, and at that point, any warranty against failure is void. Some shops may even go so far as to simply refuse to assemble anything it didn’t supply. Some shops just aren’t willing to take this risk of failure. 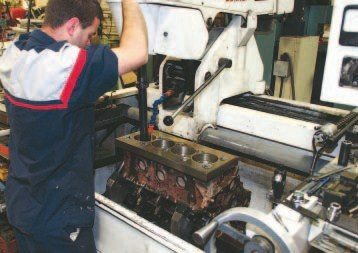 Once you have selected the machine shop you feel most comfortable working with and your rebuild project begins, it’s advisable to check in often to follow your engine’s progress. Asking questions and being visible is an easy way to learn and to be sure your project is on track. But you must also understand that, in business, there’s a fine line between being inquisitive and being a pest!